'My novel, Flying a Kite, is set principally in Bath, England, but it also includes real settings in Rome, Lake Garda, Tenerife, Los Angeles and Santa Barbara. I chose well-known settings because I like to write 'atmospheric' fiction. Hopefully I can make it seem more real because I have been to these places myself - as have many of you! To your immediate left you can just see the door of the old pub called the Crystal Palace Tavern. This is where my protagonist, Bruce Kramer, had a temporary job as a barman. It is also where he met Bertie to sound-him-out when considering to hire him as a consultant - because he truly had 'been everywhere, done everything'. 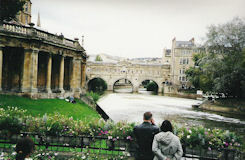 Not very far from that, to the east, you can cross the River Avon by the unusual Pulteney Bridge - seen here from its best aspect from Parade Gardens just off Grand Parade. There is an oval weir at this point which makes it particularly picturesque. There are gift shops and a little café right on the bridge itself. 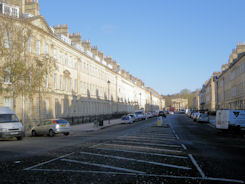 Keep walking along Argyle Street and across the roundabout at Laura Place and you enter Great Pulteney Street. Bath Abbey is one of the most photographed locations - so I have given that one a miss! 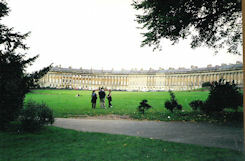 But the other, even more iconic picture related to Bath, is Royal Crescent, that masterpiece of architecture designed by the architect John Wood the Younger, and built between 1767 and 1774. This is among the greatest examples of Georgian architecture to be found in the UK and is a Grade I listed building. Higher up the hill lies its poorer - and much higher - relation, Lansdown Crescent. 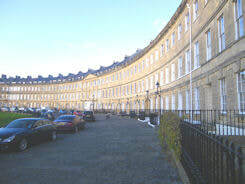 Lansdown Crescent was designed by John Palmer and constructed by a variety of builders between 1789 and 1793. This is where Bruce's girlfriend, Julia, is part-time caretaker of one of the grand houses - take your pick - and where Bruce sets up an office in the basement for his team - much against Julia's better judgement. 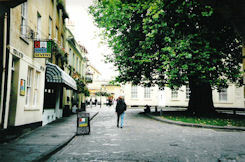 To reach it from lower Bath you face a steep pull up Lansdown Road, turing left into Lansdown Place East, which leads into Lansdown Crescent. You need to be fit and good with hills to walk to Lansdown Crescent from central Bath. Just below it is a very sloping fields - and I did see horses in it once. If you do get there, an interesting way back is to continue nearly to the end of the Crescent, turn left down into Saints Road, forking left past Chapel House and bearing right, following a footpath downhill between a field and a tall wall. It's all down-hill now! This leads into Park Street. Follow the street down into St. James Square, bear right down Marlborough Street, cross Julian Road, dog-leg right and then left into Marlborough Buildings, and you can then take a left into Royal Crescent. Beautiful Italian model Sofia Mancini, Bruce's rival in the challenge, lives in Rome. In one scene she sits at an outside café with her photographer boyfriend, Luigi, drinking coffee and gorging cake - at a fictitious café. They were in the Piazza Navano, one of the world's most famous squares, built by emperor Domitian in 86 AD on the former Domitian's stadium. Hence the long, oval shape of the square. The stadium, which had a larger arena than the Coliseum, was mainly used for festivals, sporting events and pageants. The ancient Romans came there to watch the agones ("games"), and hence it was known as "Circus Agonalis" (competition arena). 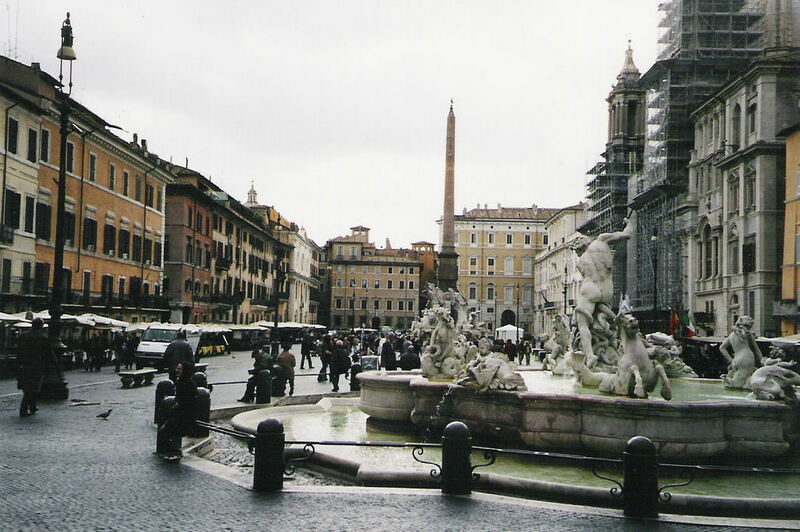 It is believed that over time the name changed to "in agone" to "navone" and eventually to "navona". It contains no less than three magnificent fountains. 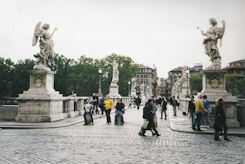 To get there from her apartment, Sofia crossed Angels Bridge, built by Emperor Hadrian to connect his grand mausoleum, now known as Castle Sant’Angelo. Originally known as Pons Aelius, it is now called Ponte Sant’Angelo, or Bridge of Angels, because of the legend that Archangel Michael was seen from there on top of the castle, with his sword drawn to indicate the ending of the plague of 590 AD. It is now adorned with angel sculptures by Bernini. These two pictures go just a little way towards showing some of the grandness of Rome's architecture. 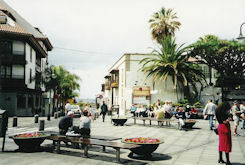 As part of their research, Bruce and Carla visit Puerto de la Cruz, on the island of Tenerife. They go there to see Albert Nailer: inventor of a drug which allows access to hidden areas of the mind - which Bruce thinks will prove to offer a dramatic short-cut in his investigations. As a result, Bruce found himself talking to God. Was it all in his mind? Were the new facts he learned just figments of his subconscious? The insights he gained made him doubt it. They stayed in the Hotel Monopol, just on the left. The central atrium area was like a jungle when I stayed there. Very impressive. 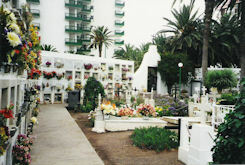 Albert Nailer's view from his apartment in Puerto de la Cruz was of the sea - but from across a cemetery. The cemetery is also where Bruce took time-out to think about his mind-blowing experience after taking Nailer's new drug. The peace and quite it offered helped him to collect his thoughts. It was fitting that they related to life-after-death! The graves, he realized by them, were little more than markers. The souls of the departed were somewhere else completely. Luigi, Sofia's photographer boyfriend, tells her he has a lead from Long Beach in Los Angeles. This is a rather deserted view of it. As an Englishman abroad, it seemed quite hot that day, but clearly the locals did not agree. Not a square-inch of flesh was exposed. When Luigi was there he was watching some girls playing volleyball. Lucky him. I guess my timing was wrong. 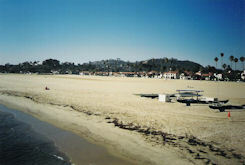 Luigi moves on to beautiful Santa Barbara to meet (somewhat nutty) Victor Freed. They have an initial discussion by what I call "the pier"; they call it Stearns Wharf. 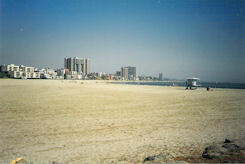 The beach alongside can be seen to have far more character than apartment-locked Long Beach above. Victor is an ex-NASA engineer with some way-out ideas, but he gets Luigi excited, and some of the detail Victor comes up with from the Bible is even sufficient to influence Sofia when she gets to see the evidence. Immediately opposite "the pier" is the main boulevard leading downtown, called State Street. It has a real spanish flavour. Luigi visits Victor Freed in his apartment here, located over a gift shop. A nice place for Victor to retire. Not cheap, though, so maybe Victor has topped up his NASA pension with a reasonable income from his sci-fi writing. No wonder Sofia wonders whether some of the material he produces verges on fiction... although he has a canny knack of providing very convincing evidence to back up his theories; not that these impress Bruce. 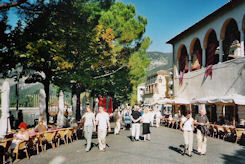 The climax of the novel takes place on the shores of beautiful Lake Garda, at the town of Garda, in Italy. Aldo Galliano's favourite home is a large house right on its shoreline. Follow the shorelike walk taken by Bruce and Sofia and you will pass it! From Garda the lake is so wide it almost looks like the sea, and it is subject to mini-waves. The far side lies on the horizon. 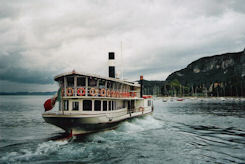 Many paddle steamers ply various routes across the lake. This is the scene that would have met Bruce's eye on his visit to Galliano's home. Prior to his final presentation, Bruce and Galliano dine in a restaurant at Garda. 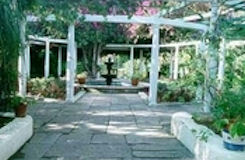 The lakeside promenade has many to chose from. Galliano knows the best, which is why he and Bruce dined here on his first evening, overlooking the lake. 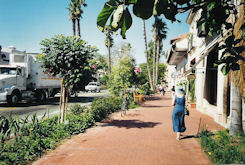 Behind the promenade lie a string of narrow, traffic-free streets. This is where you can find gift shops selling beautiful leather garments and other goods, and the more intimate taverns the locals frequent. Everyone relaxed at Garda, and relaxation was just what Bruce needed before his all-important presentation the following morning. A lot was at stake! 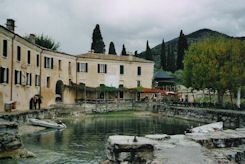 The final scenes of the novel take place in a bar on the shore of Lake Garda. You can find it too if you walk along the beach to the right from Garda. It is just as the novel describes. It has its own private little harbour and diners can sit in shade right alongside it. Inside is where the Galliano clan met, and where Galliano delighted in laying his hands on an expresso machine. A lot is revealed at this location. Everyone is in for surprises - including the reader!